Replacing missing teeth is not a luxury, but rather an important step you must take to ensure your oral and general health. Each and every tooth has an important role to play. Take one away and the consequences are seen and felt. For instance, one missing tooth can causes others to shift, leading to an improper bite that might eventually cause symptoms of TMJ. In other words, tooth loss can have a domino effect on the condition of your oral health. In addition, just knowing that people can see that gap in your smile can make you feel ashamed or embarrassed to talk or smile. To replace missing teeth, VL Dental offers dentures and partials. These removable prosthetics have long been reliable for tooth replacement and they still are today. Over the years, advances in manufacturing technology and dental materials have helped to make dentures and partials more comfortable and natural looking than ever before. If you would like to consider either one of these prosthetics to complete your smile, then speak to Dr. Vong. For some patients, extensive tooth decay or periodontal disease can make complete tooth extraction along the upper or lower jaw the best option. In this case, full dentures are a cost-effective way to replace missing teeth in order to maintain functionality and the appearance of a natural smile. A full denture consists of a base and false teeth. The base is usually made of acrylic and is designed to match the color of your gum tissue. False teeth, or pontics, made of dental porcelain or acrylic are mounted on top of the base. 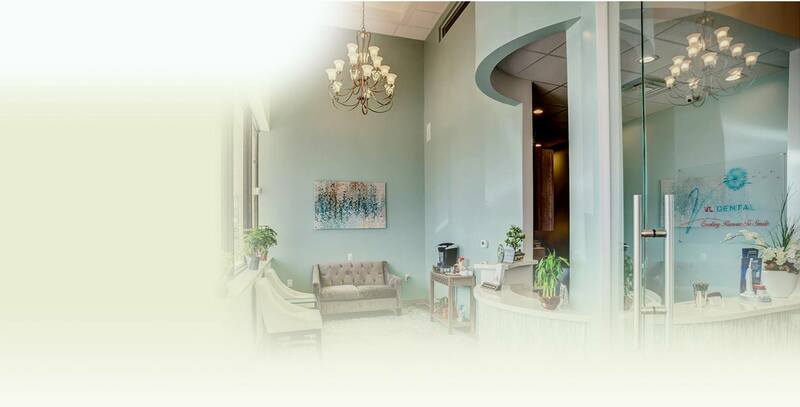 Together with Dr. Vong, you will select teeth that best complement your mouth, lips and face. Size, shape and color are all important considerations when selecting dentures that will look natural. The base of your full denture rests comfortably but snuggly along the gum ridge. For added security, many denture wearers use an adhesive that helps prevent slipping. If you’ve lost a tooth here and a tooth there, then chewing, talking and smiling may be equally as difficult for you as for the person who is edentulous. Partial dentures fill in the gaps so your smile will function and look better. In addition, a partial helps keep your other teeth from shifting. Partial dentures are built on a thin metal framework that lies close to your gum. In fact, you may not even be able to feel the partial that Dr. Vong custom designs for you. Where there are teeth missing, natural looking false teeth are attached to the framework. Gum-colored acrylic is molded into place to mimic the appearance of your own gums.